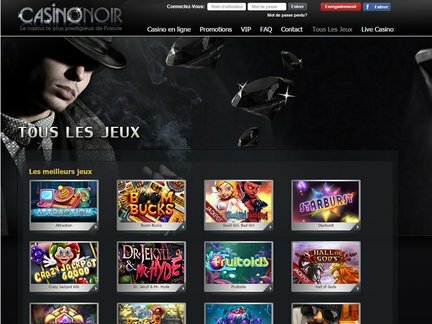 Visit Casino Noir and get yourself spoiled with a 5 Euro no deposit bonus, exclusively from our site. You don't need a code to claim this cash bonus. Upon depositing, you can claim another Casino Noir bonus which matches the value of your deposit, up to a maximum bonus of 250 Euros. Like the no deposit offer, the 100% deposit match requires no voucher, coupon or codes in order to claim. At the time of review, there were no free spins being offered by this brand. However, they do have a novel incentive for signed up members in the form of a happy hour. This is a surprise promo which can literally be triggered at any time. If you are lucky enough to be on the site when the happy hour is initiated, you can benefit from a 30% gift of extra chips for depositing. After the happy hour kicks off this Casino Noir bonus is available for a two hour period only. This brand also has a VIP scheme, but you have to be hand-picked by the casino in order to benefit. Unlike many other gaming brands, you don't qualify for the VIP scheme simply by playing regularly. While this may seem like a tough approach to customer loyalty, if you get chosen there is a certain feeling of exclusivity, knowing that you are one of an elite group within the membership. All in all, when comparing the bonuses against a competitor such as Tropezia Palace, this company is pretty much on a par, with very similar incentives. Smart phone users have good reason to be pleased with this brand. While there is no downloadable app, there's a mobile version of the flash website, making it easy to play the games on an iPad, iPhone or Android device. The brand management have obviously recognized the value of giving mobile access to members, something which its competitors would do well to learn from. Casino Noir is a French brand - very French. Although it's open to many nationalities, the text is all in French, so you'll need to use a translation tool if you don't speak the lingo. It's no surprise then that the site has gained massive popularity among gamblers in France and also Switzerland. Canadian players are accepted here, unfortunately though, membership is not accessible for players in the United States. Casino Noir has a great choice of games, all powered by Betsoft, with many titles lovingly rendered in 3D. Rather fittingly, Blackjack has a very good showing on the site, with eight different variants available. You can also try your hand at Craps, Baccarat, Casino war as well as Draw Hi-Lo. Video Poker is also well represented and you can even enjoy virtual horse racing and scratch card games. Of course slots are what many players come here for, and it's easy to enjoy your favorites for free as long as your no deposit bonus holds out. Like most online gaming brands, the registration form is simple to use and the deposit match bonus reduces your risk while trying all the different slot titles. The most popular slots on this site are Mr. Vegas, 7th Heaven, Tycoons and Jackpot Winner. One of the newest 3D Betsoft titles is rapidly becoming a favorite: Under the Bed is a ghoulishly fun game with a great free spins feature. Jackpots at Casino Noir are pretty attractive. Some examples of recent jackpot totals are 78,143 Euros on Greedy Goblins, 29, 349 Euros on Treasure Room and 27, 244 Euros on The Glam Life. As these are Betsoft games, the progressive jackpots are shared across all sites which use the software. Therefore, the 78,143 Euro jackpot could be won by someone playing at any of those sites. Some recent winners among the membership of this gaming venue include Dima K. from Denmark, who won 10,000 Euros on Aztec Treasure 2 and Alex G., another Danish player who got 10,000 Euros lucky on the same slot title. This is one online gambling company that has a very good reputation, with no complaints of note logged against it. Members report positive experiences with customer support, even for those who are not French Speaking. The general consensus among players appears to be that there are no problems with bonus claims and withdrawals are processed without fuss. This brand gets 5 out of 5 for complaints and handling. The only black mark, or should that be "noir" mark, against this brand is the fact that it holds a license In Costa Rica. This country is not known as having the best online Casino jurisdiction. The reasons for choosing Costa Rica are not clear. However, with this company's members reporting many positive experiences, only the most paranoid customer would let the choice of Licensing country bother them. Moreover, the company has also obtained licenses in Belize and Alderney in the Channel Islands. This brand was launched in 2010 and is operated by Redcorp. I loved the fact that Casino Noir has a mobile version of its software. While not quite as intuitive as some app-based competitor software, it made for easy access to the games on my iPad, iPhone and also on a colleague's Android tablet. I'm a big fan of the Betsoft gaming platform, so unsurprisingly I found the well-crafted 3D slot titles on this site to be absorbing and fun to play. Signing up was a hassle-free experience, and I was soon in and playing with my 7 Euro bonus, although it was soon gone too. Depositing was simple and I like the fact that you don't have to look for the right coupon or voucher code. The Under the Bed game really is a lot of fun, especially as I like slots that reward you with free spins: for some reason I always seem to win on those. Apart from the problem of trying to understand all the French language, I would heartily recommend this brand to anyone.